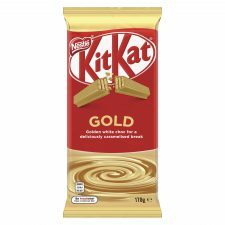 Following overwhelming demand from Aussie chocolate fans, KitKat has announced that its world-first flavour innovation, KitKat Gold, is ditching its limited edition status and staying in stores. The launch last August sparked a gold rush across the nation and saw Nestlé HQ inundated with hundreds of calls from passionate fans declaring their love for the new flavour. Chocolate fanatics simply could not get enough of the delicious, creamy golden white choc covered wafer fingers. This resulted in KitKat Gold flying off the shelves in record time, smashing all expectations. Nestlé Confectionery Marketing Head Anna Stewart said: “The reaction we received from our fans has been absolutely phenomenal. KitKat Gold has sent chocoholics into a frenzy – it’s like nothing we’ve seen before. “We attracted the attention of chocolate lovers across the world, with fear of missing out leading to bids of almost $200 per block on eBay.